Annual climber, monoecious; stem scabrid and angular; tendrils branched. Leaves simple, alternate, softly hairy, not harsh, long petiolate, leaf-blade broadly cordate to triangular, shallowly lobed. Flower solitary, large, campanulate corolla with widely spreading, mostly reflexed lobes, orange-yellow; staminate flowers on short pedicels, with ovary oblong or discoid, unilocular and style thick with 3 two-lobed stigmas. 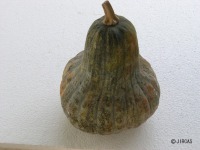 Fruit a pepo, stalk hard, smoothly grooved, enlarged at fruit attachment. Seeds numerous, flattened, white or tawny. Many local landraces of C. moschata are grown by various ethnic groups. 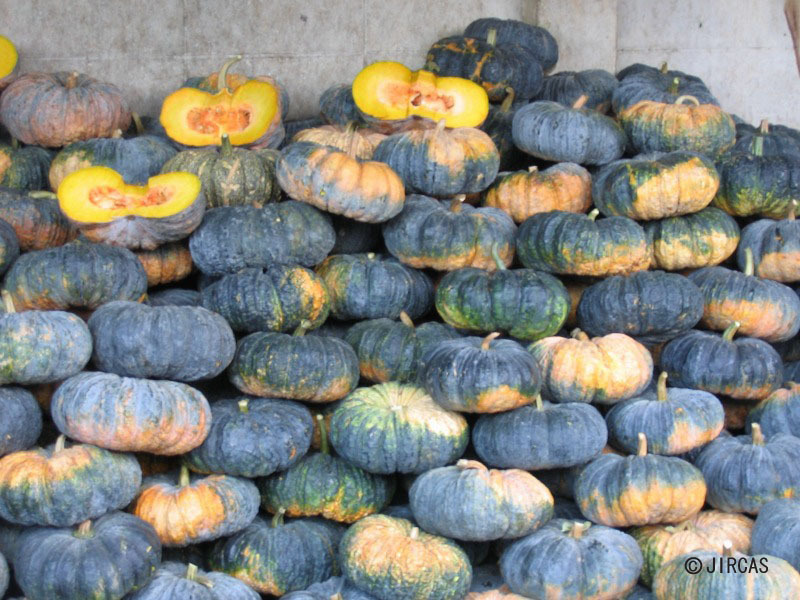 Selected cultivars are common vegetable crop in Thailand, they prefer full sun, moist and fertile soil. Mature fruit is commonly used as ingredient of various kinds of spicy vegetable soups. 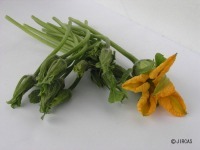 Young shoots, flowers and fruits are also eaten. Per 100 g edible portion of mature fruits contain: water 85-91 g, protein 0.8-2.0 g, fat 0.1-0.5 g, carbohydrates 3.3-11.0 g, vitamin A 340-7800 IU, vitamin B1 0.07-0.14 mg, vitamin B2 0.01-0.04 mg, niacin 0.5-1.2 mg, vitamin C 6-21 mg, Ca 14-48 mg, Fe 70 mg, P 21-38 mg, Mg 16-34 mg, P 21-38 mg. Fresh seeds are used as a vermifuge, and seed decoctions as diuretic, reduce fevers. Pumpkin is grown from seeds; direct seeding at 1.5-2 m spacing is recommended.